BY LAND AND SEA: Asian imports have kept the Port of Vancouver humming, but U.S. East Coast ports are cutting into the action. Intermodal on-dock rail service provides rapid turnaround for the movement of imports and exports. as the expanded canal was completed and that means more cargo is being handled from fewer ships. number of vessels serviced fell by 18 percent. That’s testimony to larger cargo volumes per ship. What does all this mean? The new giant containerships bring the prospect of increasing cargo volumes—but also port congestion, straining the capabilities of terminals, roads and truckers to handle them. Developing rail alternatives to get containers to and from East Coast ports has become all the more critical, and millions of dollars in investments have been brought to bear to respond. But the phenomenon is not limited to the East Coast. As the data cited above suggests, the expanded Panama Canal has pitted East Coast and West Coast ports in greater competition for Asian cargo. So, it’s just as important for ports from Washington to California to invest in the rail infrastructure to make the handling of imports and exports that much more efficient. Rail is critical to the competitiveness of the Northwest Seaport Alliance, which comprises the ports of Tacoma and Seattle, according to Mike Reilly, NWSA’s director of Intermodal. “How we handle the rail system is tied to the level of discretionary business we are able to attract,” he says. Thirty-five percent of imports at NWSA are transloaded to 53-foot equipment, half of which departs the port by rail. can do to take cargo off the road,” says Bethann Rooney, assistant director in the PA’s Port Commerce Department. The seemingly meager NYNJ rail numbers actually represent improvement, as on-dock rail lifts increased 65 percent since 2005. That growth is attributable to $600 million in investments in the Port Authority ExpressRail yards in Elizabeth, Newark, and Staten Island, as well as significant private investments. One area facility, the Port Newark Container Terminal, doubled its on-dock rail track from 5,000 to 10,000 feet, part of a $500-million expansion begun in 2011. Containerized cargo volumes grew at PortMiami by 17 percent between 2014 and 2016. The Florida East Coast Railway (FECR) on-dock intermodal rail service connects the port to a network reaching 70 percent of the U.S. population within four days. At NWSA, investments in 2016 and 2017 of $18.5 million contributed to the reworking of all storage tracks at the Port of Tacoma, making operations more efficient and improving capacity and fluidity. The project also involved the expansion, from three to five, of the number of arriving and departing tracks in the harbor. “Before, we could not arrive and depart trains concurrently,” Reilly notes. Since Nov. 1, 2017, Tacoma and Seattle service intermodal trains of up to 10,000 feet in length. 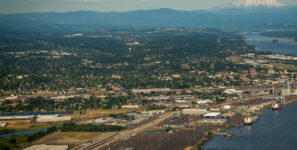 Future developments include the redevelopment of Terminal 5 in Seattle, where the recently completed environmental impact statement calls for the buildout of additional rail capacity in that location, depending upon future requirements. by a railcar float service from New Jersey terminals to the 65th Street Rail Yard in Brooklyn. This hybrid rail/water operation eliminated 1,200 truck trips in 2016.